Imelda Staunton as Momma Rose. Photo by Johan Persson. 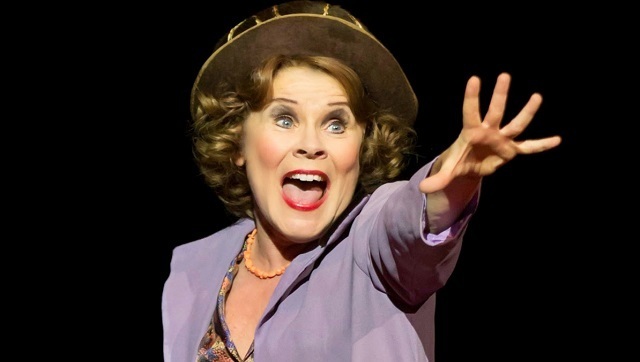 Imelda Staunton is nothing short of explosive in Jonathan Kent's version of the musical Gypsy at the Savoy Theatre. The depression era tale centres on Momma Rose who will stop at nothing to transform her two girls into stars in the kitsch world of children’s vaudeville. A sharp-tongued, quick-witted and hard negotiator, Rose is a woman of many dreams, except the fulfilment of her own. Along with her new-found, saintly companion Herbie (Peter Davison), she ferries the broke troupe around in a desperate search for their next gig. The dramatic tension reaches a height years later when the prettier, squeakier daughter June (Gemma Sutton), who Rose has favoured over the years, defects, forcing Rose to scrabble together the next project. Unfortunately this means the same cheesy number played out in a variety of different costumes, which is aptly nauseating. Rose then aims to find stardom for her other, “two left footed” daughter, Louise (Lara Pulver) whose most recent gig has been playing the back-side of a cow. Opportunity finally knocks for Louise, but it comes from the more risqué world of burlesque. The girl transforms into a woman before our eyes and the troupe’s signature children’s song Let Me Entertain You morphs uncomfortably into a sexually suggestive ballad as she heads into striptease stardom as Gypsy Rose Lee. A great actress, Imelda Staunton’s intense performance as Momma Rose constitutes a career highlight, making you shudder as you wrestle to decide whether her ambiguous actions are for her character’s own delusional self-interest or that of her daughters. It’s a dramatic part that asks you to accept the idea that even a tough momma’s love is still a momma’s love. Anthony Ward’s set design is absolutely gorgeous and the punchy dialogue work together to off-set the heart-breaking truth of an economic era in which survival often trumped moral righteousness. Other show highlights include a moonlit dance to All I Need Is A Girl and You Gotta Get A Gimmick performed by a hilarious burlesque trio. Gypsy will entertain, impress and even overwhelm as it showcases in dazzling splendour the devastating consequences that sacrifices in the cut-throat world of showbusiness can have on those chasing dreams.